All kinds of properties are vulnerable to drainage issues, whether they’re connected to a mains sewer line or they rely on a septic tank system. Whenever one of these problems develops, it needs to be dealt with as soon as possible. Otherwise, you could be looking at a costly repair bill further down the line – one which could be completely avoidable. The Drainage Care UK team can deal with a wide range of drainage issues across the South-West. 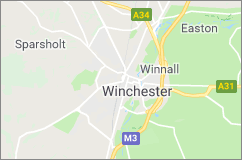 If your home or business is suffering from blocked drains in Winchester, you need to get in touch with an experienced team today. Our drainage specialists can identify and remove all kinds of blockages in your pipes. When required, we will even be able to provide complete repair or replacement services for pipes which are no longer fit for use. Why do You Need to Deal with Blocked Drains in Winchester? Blocked drains can lead to a wide range of problems, particularly if you don’t deal with them as quickly as possible. Some people tend to think that the damages caused by blocked drains are limited to slow-draining sinks, baths and shower, or an unpleasant gurgling sound when the liquid is eventually cleared away. While these symptoms can be irritating, they are only an indicator that something is wrong. As blocked drains in Winchester properties become serious, they can cause a great deal of damage and even cause health hazards if not cleared effectively. One of the most common issues that blocked drains can lead to is a major pressure spike within the system. If these blockages are left untreated, they can cause the water pressure to rise. This can result in a range of serious problems, including burst pipes. In some cases, the pressure can even cause the wastewater to flow back up the pipes and emerge from your drains. This can lead to water damage and flooding across your property. In many cases, it can also contribute to mould and damp developing in your walls and on your floor. There is the risk that human waste can become trapped in your pipes due to the blockage. That can create a major health hazard and lead to a wide range of diseases and infections. It can also create disgusting smells which can stop any kind of property from being habitable. If you can smell human waste or sulphur around your Winchester property, then you need to get in touch with the professional team at Drainage Care immediately. What are the Main Causes of Blocked Drains in Winchester? When one or more of your drains does become blocked, it is important that you know where it is located and how the issue developed. Failing to understand this key information can result in ineffective unblocking treatments and can often lead to the blockage returning on a regular basis. Tree Roots – As they are attracted to the water in your drains, roots from nearby trees will attempt to access your pipes. Roots can grow into even the smallest crack or hole in the pipe. They can also grow quickly throughout your pipes and lead to extremely resilient and hard-wearing blockages. Vermin and Pests – It is possible that vermin, such as rats or mice, can access your drains and build their nests in your pipes. They like drainage due to its warmth, moisture and darkness. It is important that you keep an eye out for any vermin on your property, especially if you are experiencing any kind of drainage problem. Water Damage to Basement Surfaces. Poor Drain Maintenance – If you flush the wrong materials, including kitchen roll, or dispose of things like fat, oils and greases in your kitchen sink, then you could be contributing towards tough and resilient drain blockages. Here at Drainage Care, we can provide a wide range of drain unblocking services for all kinds of properties in Winchester. Our team can provide industry-leading services to help your deal with blocked drains in Newbury. Our team can deliver a range of drainage services to help you resolve whatever kind of issues your property is suffering from. If you’re struggling to identify the location or cause of a blockage, we can deliver industry-leading CCTV drain surveys. We can provide a range of comprehensive drain unblocking services to help you deal with all kinds of blocked drains in Winchester and across the South West. Thanks to our industry-leading experience, we are also able to deliver comprehensive repair and replacement services. Whether your property needs a pipe repairing or an entire drainage system replacing, our team are here for you. For more information on the diverse range of services that we can provide, don’t hesitate to get in touch with our team directly. You can contact us by calling 0800 193 9973 to talk to one of our professionals today. You can also take advantage of our simple online contact form, and we’ll get back to you as soon as we can.